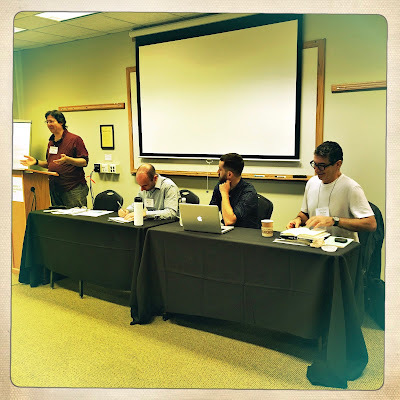 Opening comments, "Roundtable on Sraffian Economics as Part of the Radical Political Economics Tradition," URPE 50th Anniversary Conference, September 28th, 2018. What should the purpose of studying the history of economic thought be? That purpose doesn't, of course, have to be singular, but it's a question that I regularly feel pushed to answer as I often find myself teaching undergraduate courses in the history of economic thought, as I'm sure many of us do. At one level I feel fortunate to find myself in a heterodox program that welcomes the study of the history of economic thought, and in fact requires our undergraduates to take a course in it. But I also feel the need to justify the course's place in the curriculum. Indeed I normally spend the first day of class questioning, with students the larger purpose of the course. Some arguments seemed destined to fall on deaf ears. As Sraffa suggested of the Classical economists at the outset of his lectures on the advanced theory of value, “the best thing would be to read them in the original – I'm sure you would find them more readable and less abstruse than the modern economists, but I suppose there's very little chance of inducing anyone to read them” (Sraffa Papers, D2/4). Certainly we ought to reject the old claim of Pigou that the HoT is little more than a litany of “the wrong ideas of dead,” but what can we say in its place? Some heterodox historiography exhibits an understandable tendency to treat the history of economic thought as a genealogical project. We want to feel rooted in the past, to feel that we're not quite so alone, or that we were not always so isolated from mainstream discourse. In some cases then, HoT therefore becomes a search for this or that prescient and neglected thinker to remind us that once, is some far off and idealized past there was a more open, more pluralist economics. Thus we tell stories about the heyday of old Institutionalism or of the historical schools and recall times when, to borrow Keynes' phrase, “the weather was delightful and the mind free to be fertile of new ideas.” I worry not only that such an appeal in likely to be entirely lost upon students, but also that this renders it even easier for the mainstream to dismiss or marginalize the history of thought as a pursuit for indulgent specialists. Already in 1929 Sraffa plainly expressed disdain for these approaches. In his view we must not overlook “the fact that economic theories, whether ancient or modern, do not arise out of simple intellectual curiosity of finding out the reasons for what is observed to happen in the factory or in the marketplace. They arise out of practical problems that present themselves to the community and which must be solved. There are opposite interests which support either one solution or the other and they find theoretical, that is universal, arguments in order to prove that the solution they advocate is conformable to natural laws, or to the public interest, or to the interest of the ruling class or to whatever is the ideology that at the present moment is dominating.” He goes on to suggest that it is only later, as theories undergo some evolutionary process, that they come to be regarded as the outcome of impartial inquiry, and comparatively unassailable for that reason. Sraffa's work is thus a reminder that economic theory is both infused with ideology, and that it is contestable. It is a reminder that the study of the history of thought should not offer a picture of the smooth and orderly ascendance of incontestable truths, but of the rifts, ruptures, and debates that continue to animate the discipline. Sraffa also suggests that the outcome of our study of the history of thought should not be absolute fealty to the ideas of any one thinker. He rightly suggests that in our study of Ricardo we should recall the it was the distribution of the total product between landowners and the remainder of society that was his principal focus, not the division between wages and profits. Ricardo's own views changed over his lifetime, but as Sraffa suggested, “however the historical point as to the interpretation of Ricardo is settled...it's true to say that Ricardo's views on this point are not very important” (Sraffa Papers, D2/4). Though the question may be central to our own historical moment, it was less so for Ricardo, and played only a minor role in his theory. Archival efforts to more clearly reveal the genesis of Sraffa's own ideas are laudable, and testify to the importance of Sraffa's engagement with Marx as a sustaining motive force in the work that culminated in the Production of Commodities by Means of Commodities. But is it important to ask if Sraffa was ‘really’ a Marxist? I would suggest not. Similarly, Sraffa's well-reasoned and foundational criticisms of neoclassical theory have been rehearsed and staged for nearly six decades, to no great destructive effect. In Sraffa's own spirit it seems more important to ask what what “practical consequences” we can draw from this work today. One simple suggestion is that our theory of the functional distribution of income must be institutional and sociological. Insofar as the pace of accumulation is understood to depend on this functional distribution of income, or on the sources of autonomous demand, any non-neoclassical growth model is, at its foundation, an institutional theory of growth. Thus rather rather binding ourselves to a singular approach we might recall Sraffa's suggestion that “[o]ur metaphysics is in fact embodied in our technique; the danger lies in this, that when we have succeeded in thoroughly mastering a technique, we are very liable to be mastered by her” (Sraffa Papers, D3/12/4).